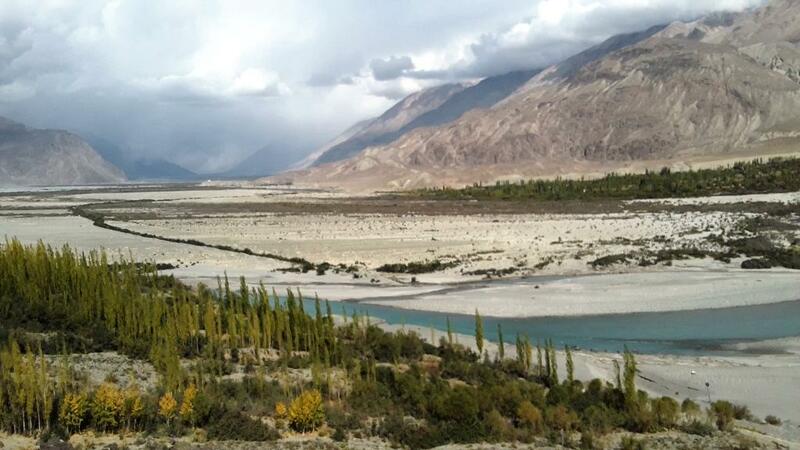 The early morning was bathed with bright sunlight flooding the Nubra Valley. Every tree, bush, fresh blooms and the orchards of Hunder had adored their blissful colours shedding their overnight dullness. 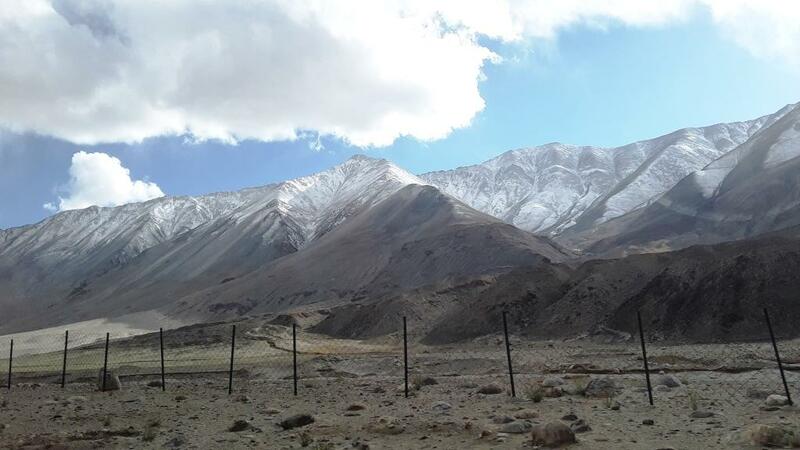 The surrounding rugged dark grey mountains look formidable in the brute elegance. 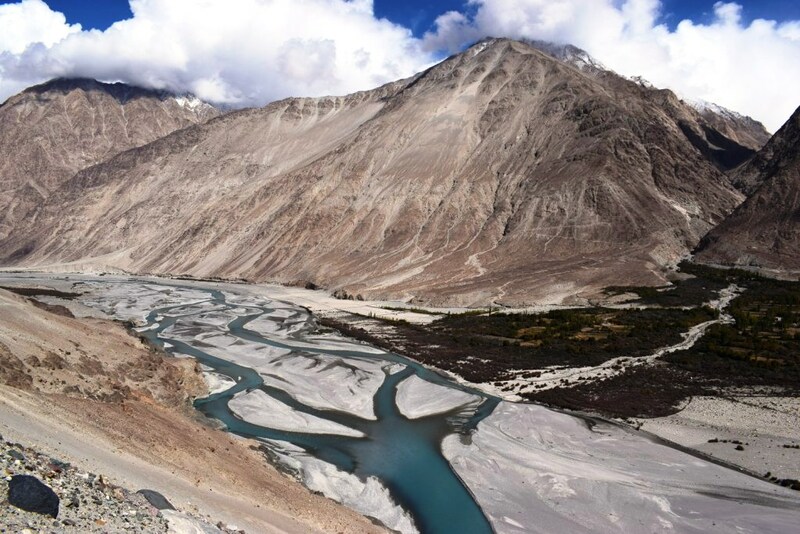 The immortal verses of the Kashmiri poet Ghulam Ahmad Mahjur were flooding my mind…. O country lass, O sweet dear! 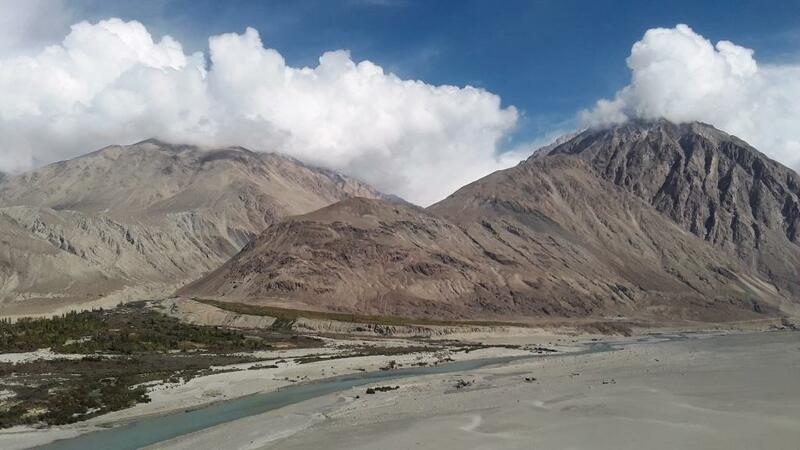 Himal of heaven, fairy from Kaf! Who has filled your buds with fragnance keen? Who has given you your colours divine? It was time to bid adieu to Hunder. 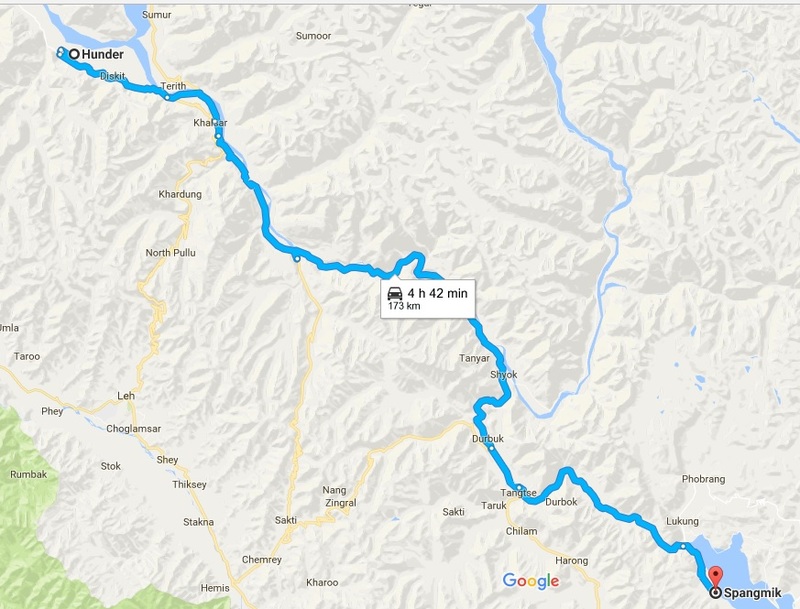 We would be taking the seven hour roadtrip from Khalsar through the Shyok basin to the mystic blue waters of the Pangong Lake. 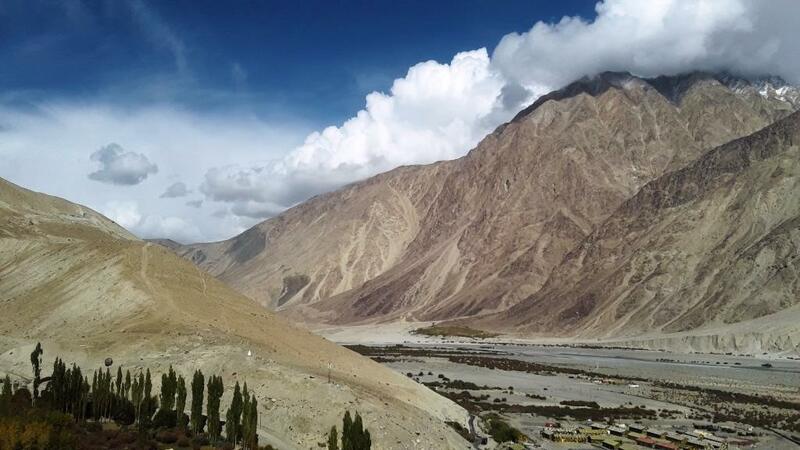 We admitted that the aura of Nubra had cast a lifelong impression of love and belongingness that was hard to ignore. 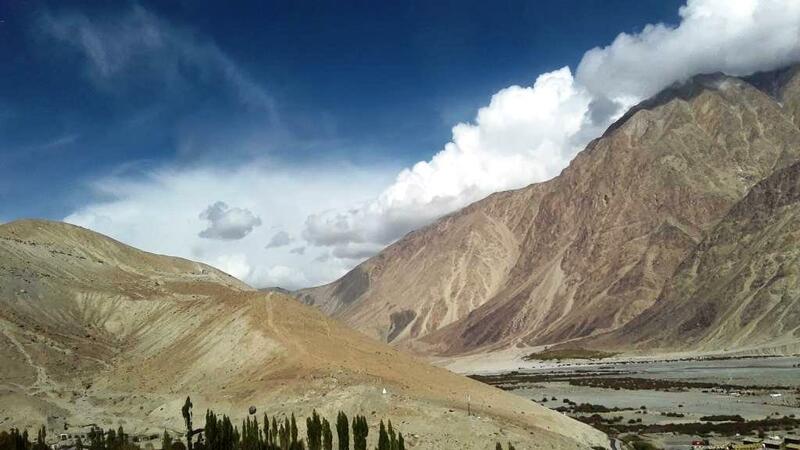 All of you must be wondering why in the whole world we had chosen the less known Shyok-Durbuk-Pangong road instead of returning back to Leh via Khardung La. 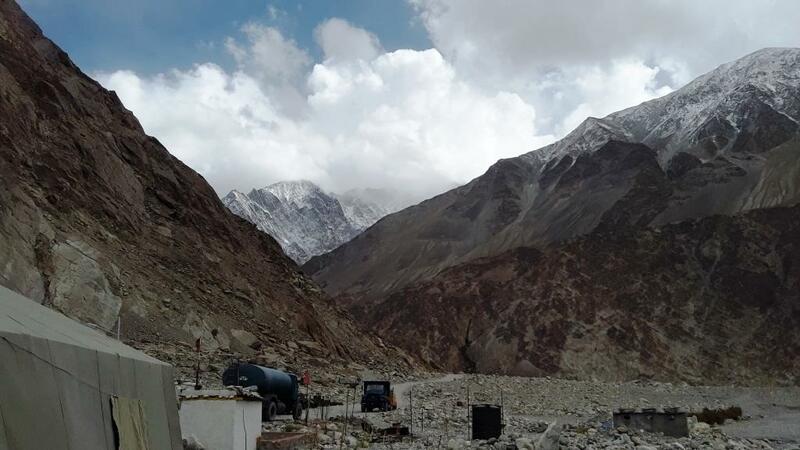 The reason was quite obvious – we all wanted to avoid the toiling uphill climb of the Khardung La on our way back to Leh. 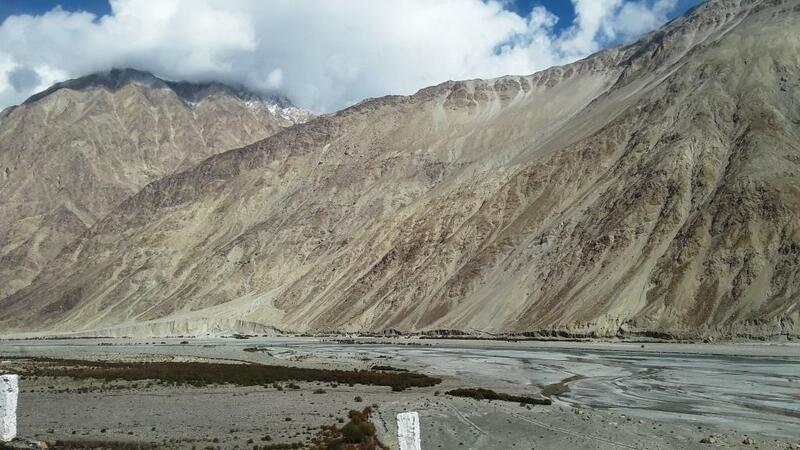 Further going back to Leh also meant that we would need to take the Leh – Manali Highway and reach Pangong via Hemis, Chemrey and Durbuk after climbing the formidable Chang La pass. This entire exercise would literally mean losing an entire day in travelling. 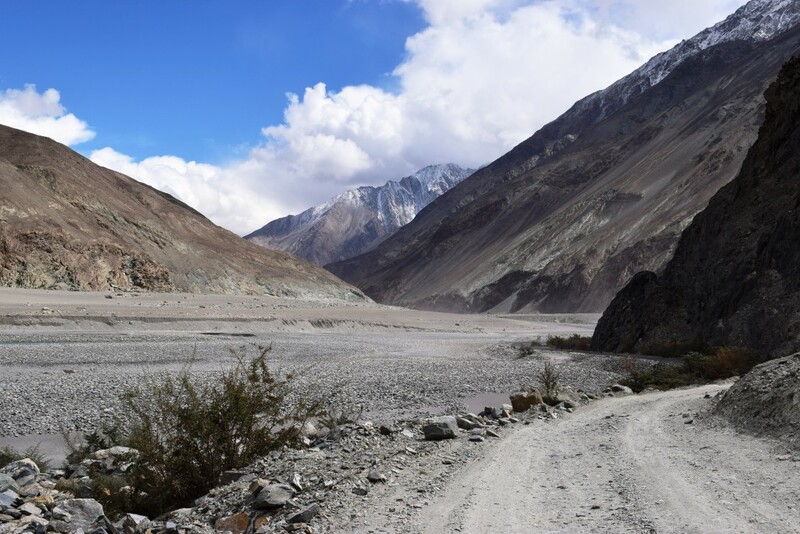 The Shyok-Durbuk-Pangong drive was nothing less than an adventure of its kind – with the road piercing through the picturesque Shyok basin. 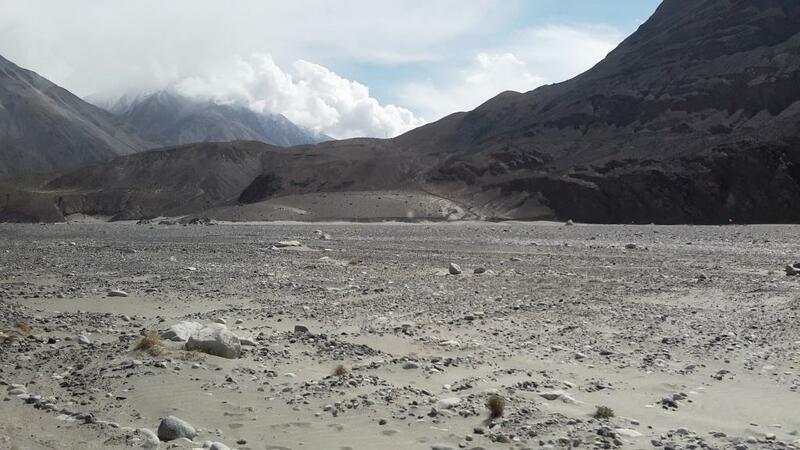 We were also aware of the perils awaiting us on this treacherous strip of road with frequent land and mud slides flooding the Shyok river. Yet the decision was taken! We already were on our way towards Khalsar. 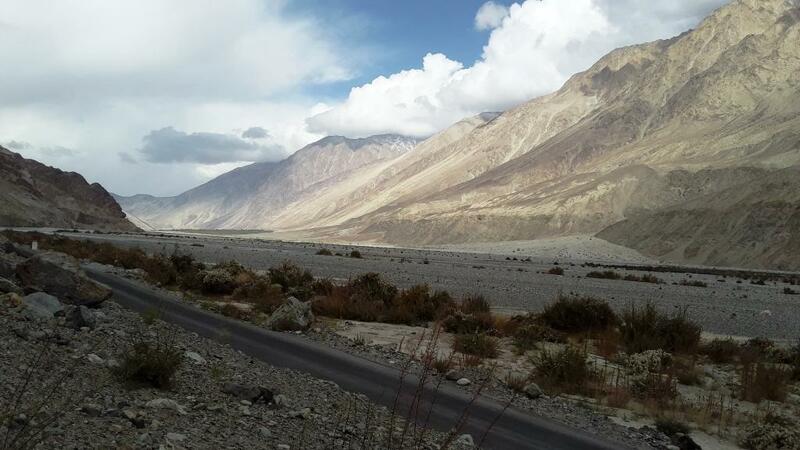 After crossing Diskit, we took the uphill road before climbing down to the Nubra Valley floor. The entire valley was looking graceful adoring their artistic shades. The desert sands were glittering like dusts of gold in the morning sun. 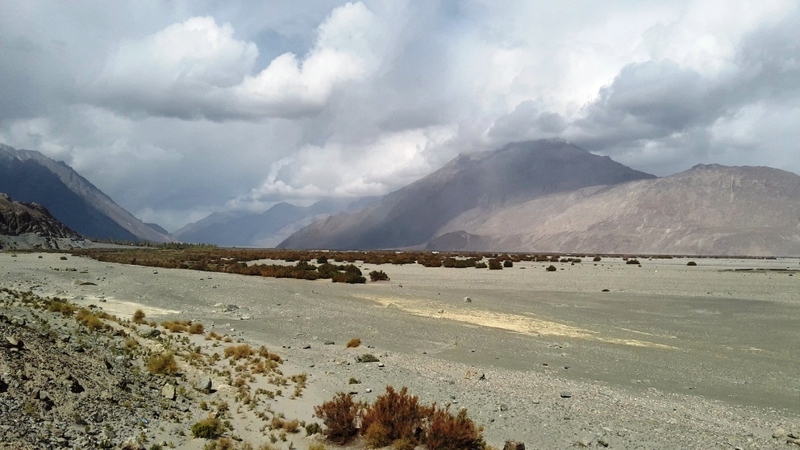 The distant mountains on the other side of Shyok were looking shady and mysterious; with the day blooming into its full glory, probably it was also their time to wake up into their colourful bliss. The entire span of the vast desert lay stark open to our left. 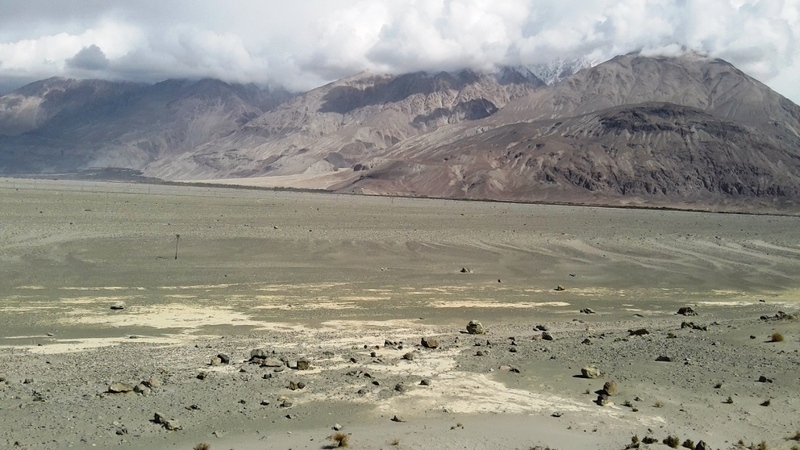 Much of this view was taken away by yesterday’s desert storm on our way to Hunder. We were slowly climbing uphill and the valley floor was disappearing way down. 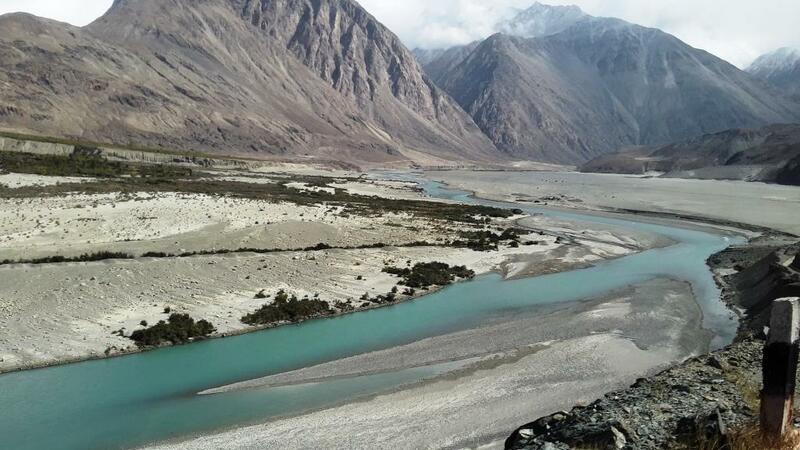 The serpentine green waters of the Shyok river were flowing elegantly down the valley. 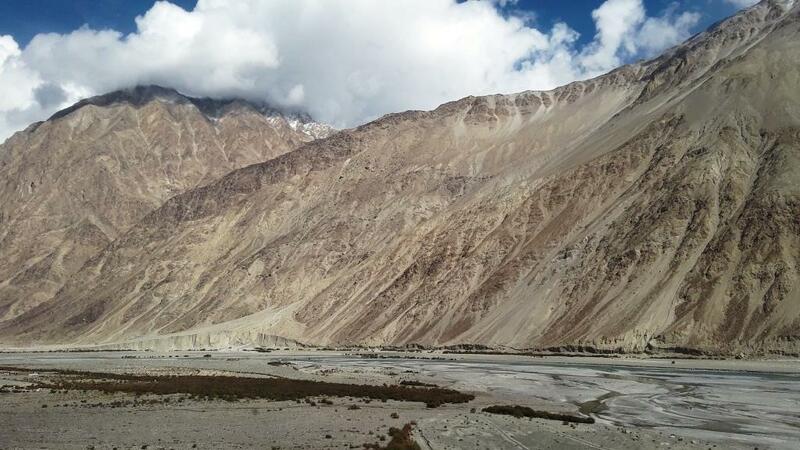 The grey mountains on the other side had now shed all their misty covers and had bloomed into their majestic presence gracefully guarding the Nubra Valley. After another ten minutes of uphill climb it was our turn to climb down to the valley floor to take the desert. This part of the desert was peculiar. The sand dunes were replaced by a pebbled floor. A number of desert resorts appeared on our both sides. 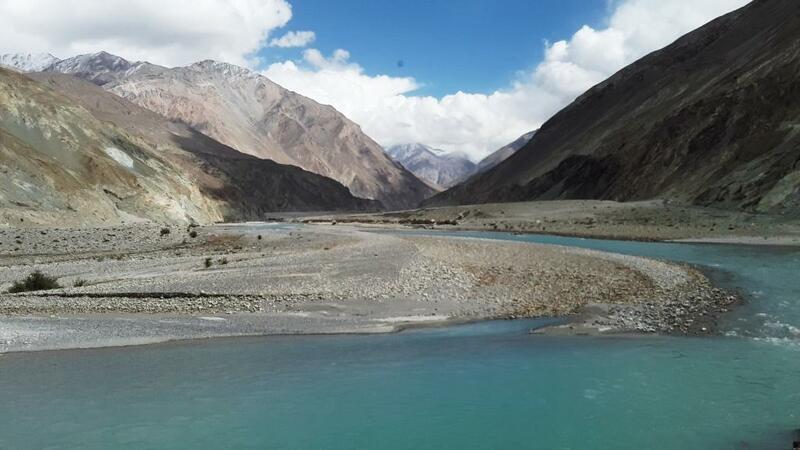 Most of these resorts had river camps, picnic spots, camel rides and desert bike rides for tourists and visitors. 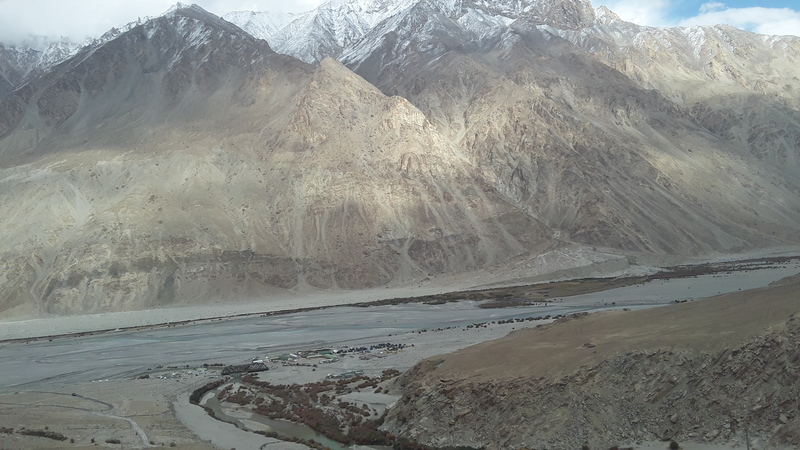 We were approaching Khalsar. 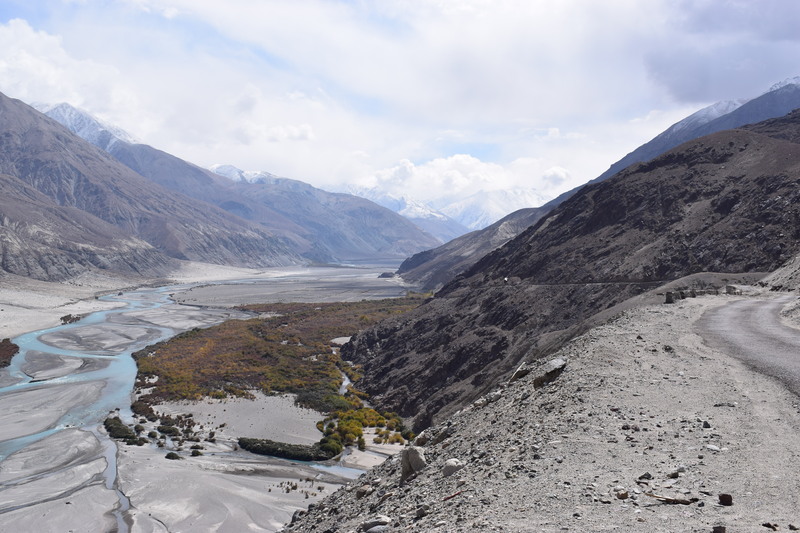 Leaving the narrowing Shyok basin in our left, our SUV was once again moving uphill towards the Shyok road. 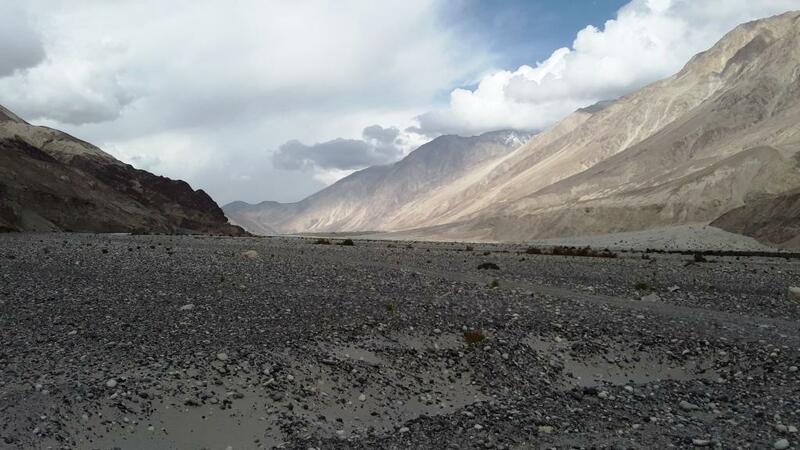 After leaving the junction of the Shyok and Khardung La-Leh roads, we were left all alone in a desolate strip of land leading us to an unknown destiny. 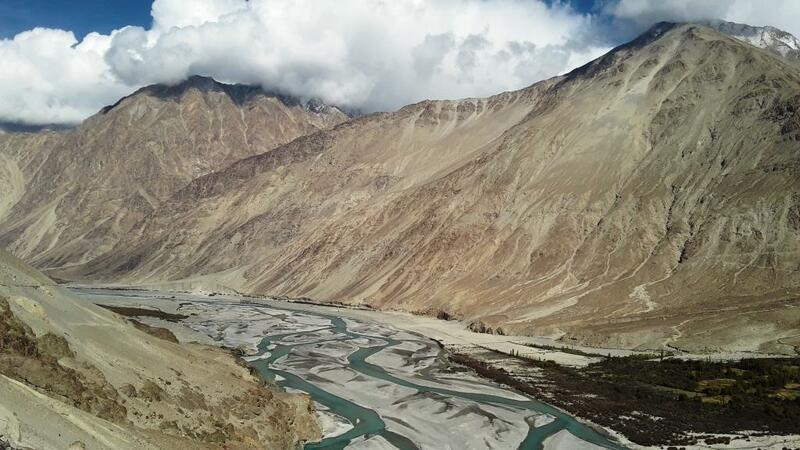 We were climbing once again and the Shyok river was elegantly gorging its way down to the Nubra Valley. The skies had turned deep blue with the early morning mists and the cloud cover disappearing in the North. There were amazing shades of grey all around us. 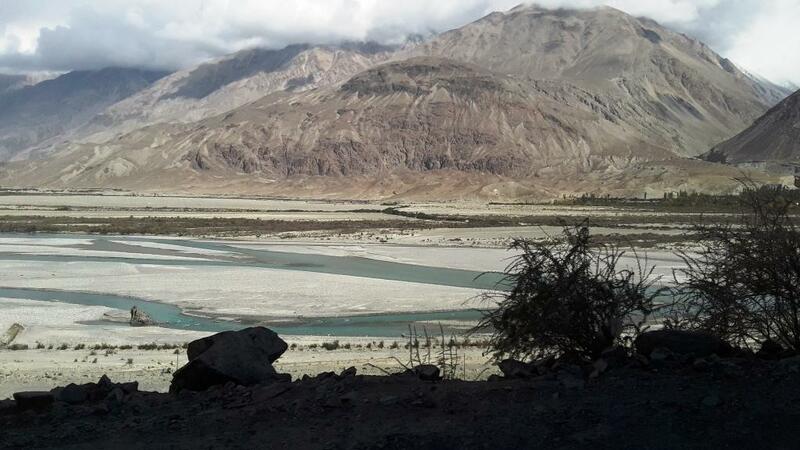 The green Shyok river lay way down the gorge majestically twining its way towards Nubra. 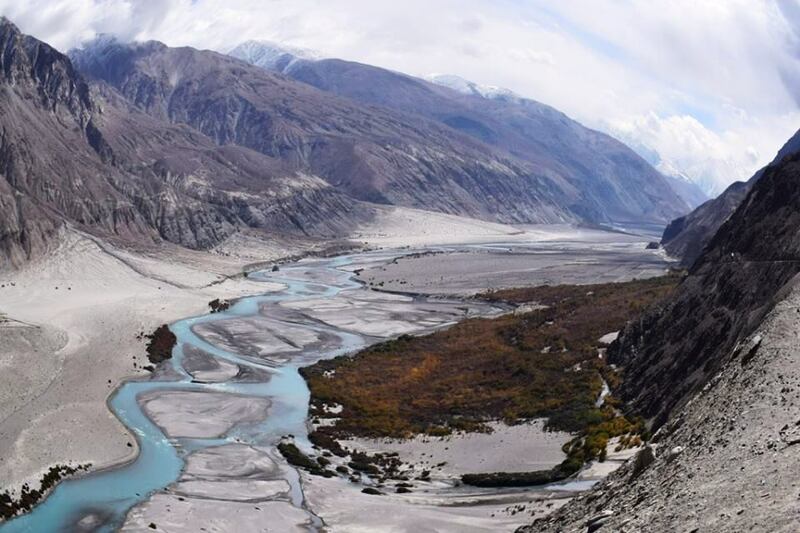 The river basin was looking like a delta with the main stream being bifurcated into a number of branches piercing the narrow valley bordered by dark green oasis in its Northern banks. 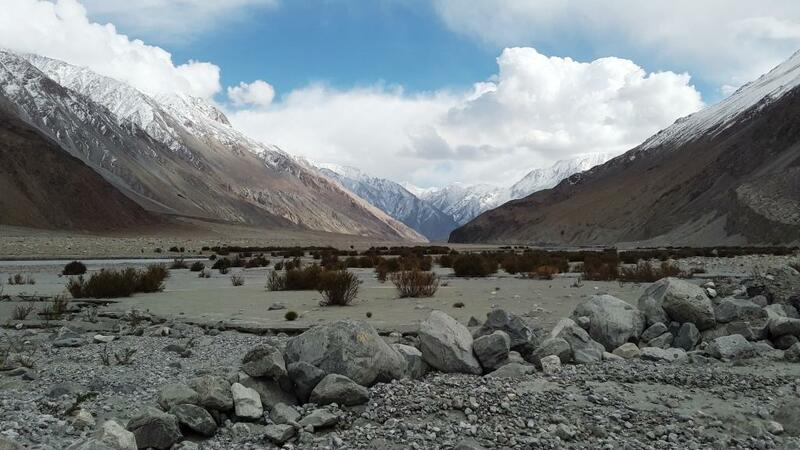 The silence, serenity and the pure wilderness around the Shyok road was magnetic. 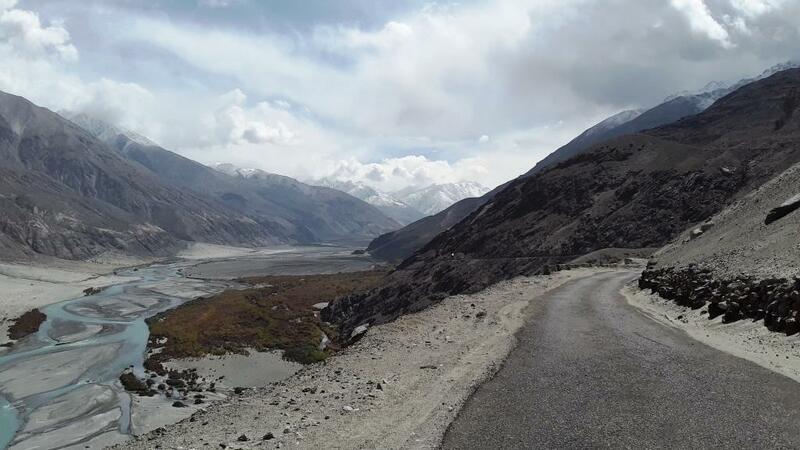 It was only us left alone with the road, mountains, gurgling Shyok and the murmuring breeze blanketing us with an amazing aura. 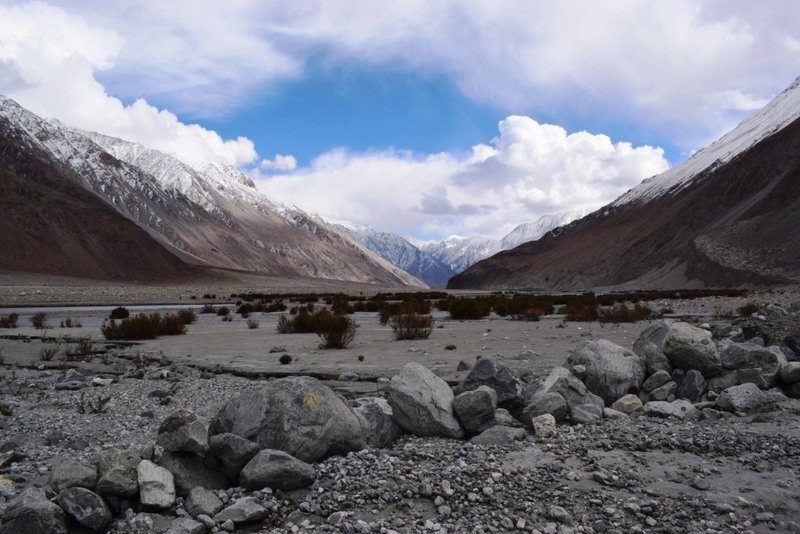 The Shyok basin gorged its way up towards a massive snowy range. 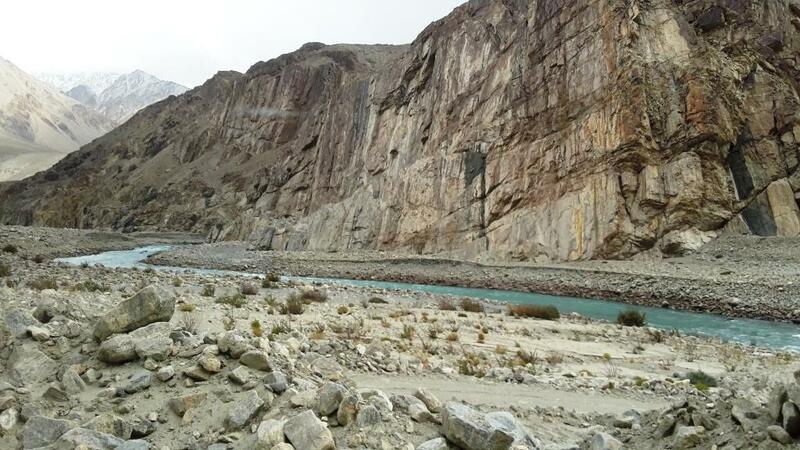 We were now gradually climbing down to the river basin leaving the towering mountain walls to our right. 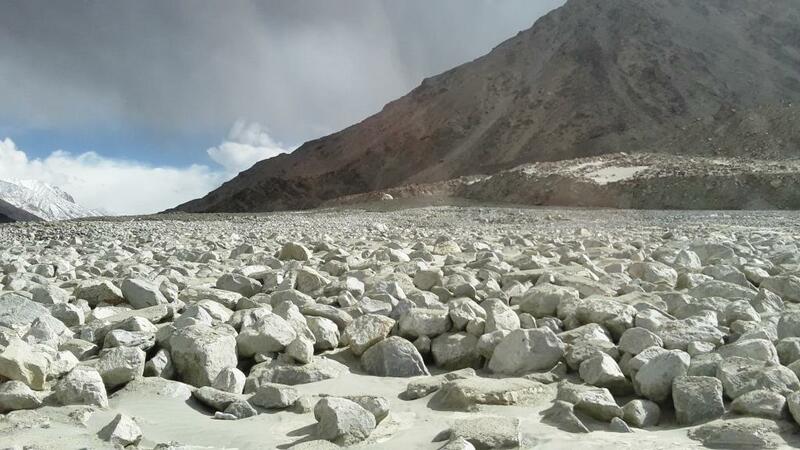 The sandy texture of the river basin was replaced by a rocky and granular floor carpeting both the banks. 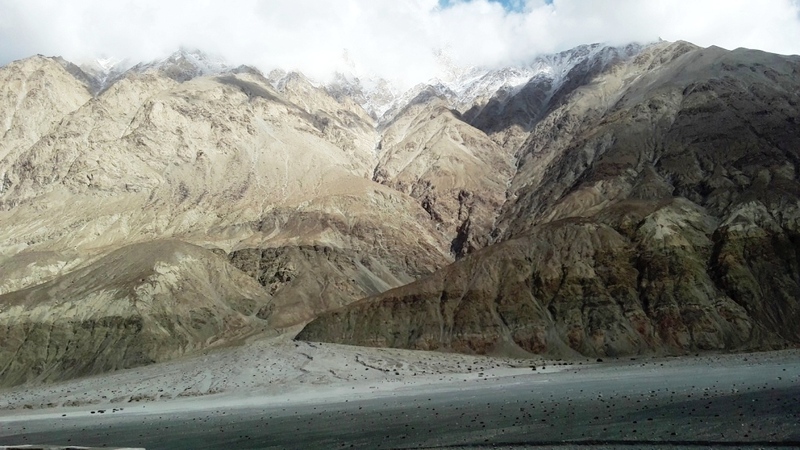 Tinges of fresh snow on the towering peaks were glittering in the broad daylight. We entered a flat table land with the river gorging up the basin. The road unlike any mountain terrain was running flat and straight. Our vehicle sped its way through this amazing trail. Every moment, every frame looked like an amazing postcard. We slowed near a flat rocky terrain. There was virtually no trace of any remains of the road here. Hassan Ji was finding it difficult to get a decent grip with the rock granules and the soft mud making the remains of the so called road slippery and dangerous. We were skidding frequently. 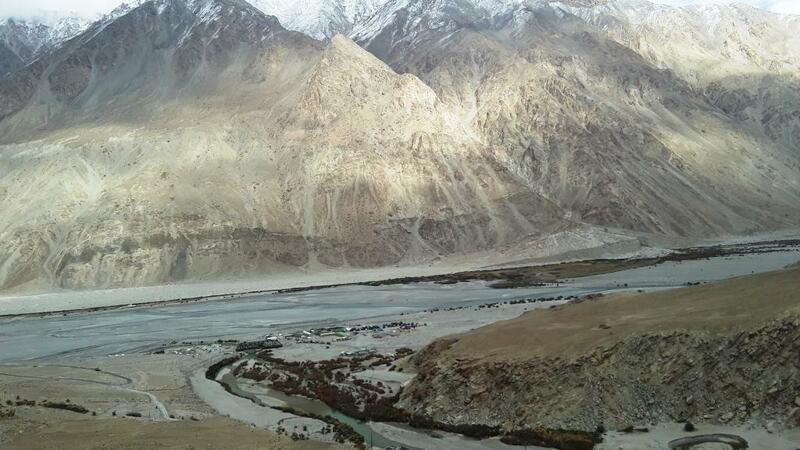 Inspite of the hardships we sailed into a now approaching dusty strip of road taking us closer to the Shyok river. The river took a wide bend towards the left and so were we. 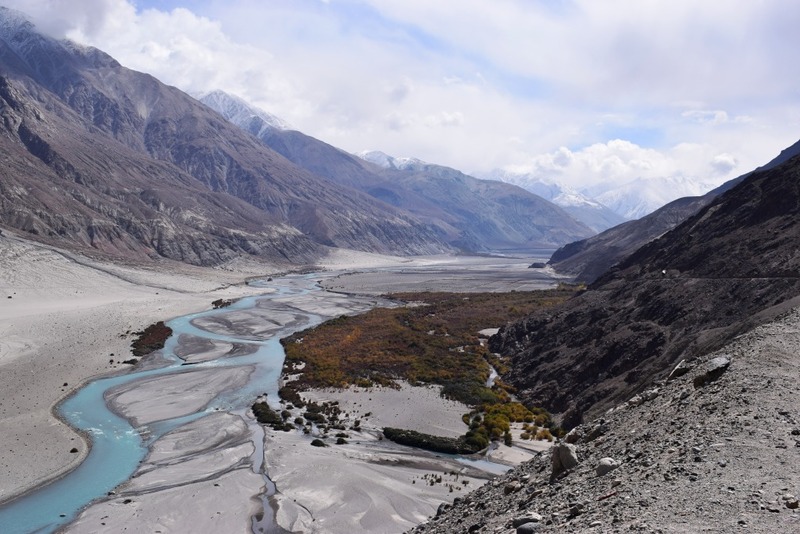 The terrain soon became rocky with the river basin gorging its way up across the approaching mountains. 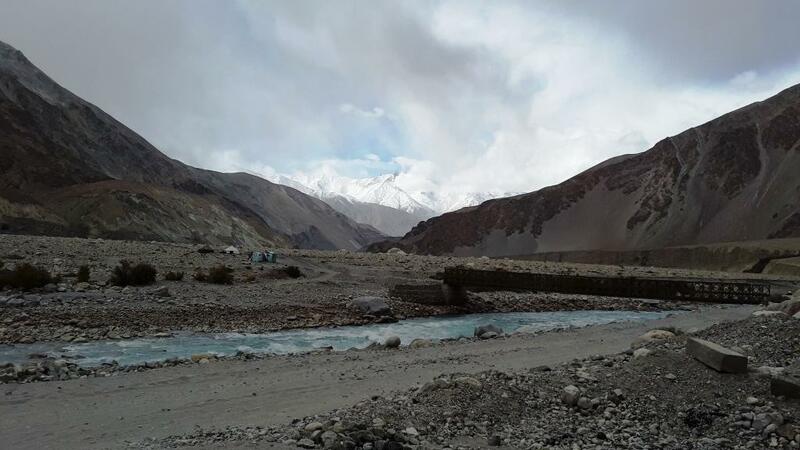 An iron bridge led us to the other bank of Shyok. There was a small outpost with five tents. It was time to have a much awaited break for lunch at the humble canteen with Maggi and black tea. 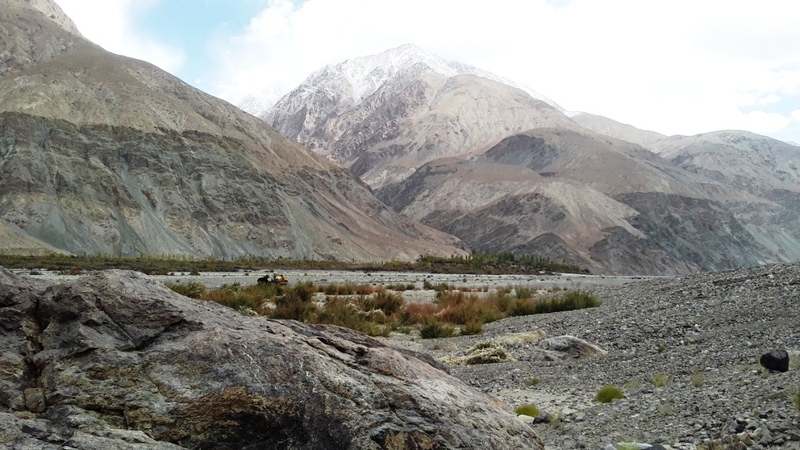 We were almost 40 Km from Khalsar and the Shyok village was another one and half hour journey from this point. 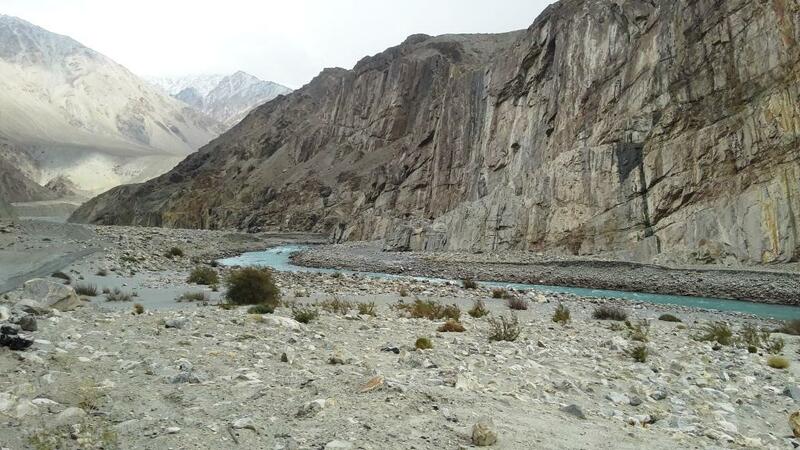 We soon entered a harsh terrain, with the river entering into a narrow gorge. 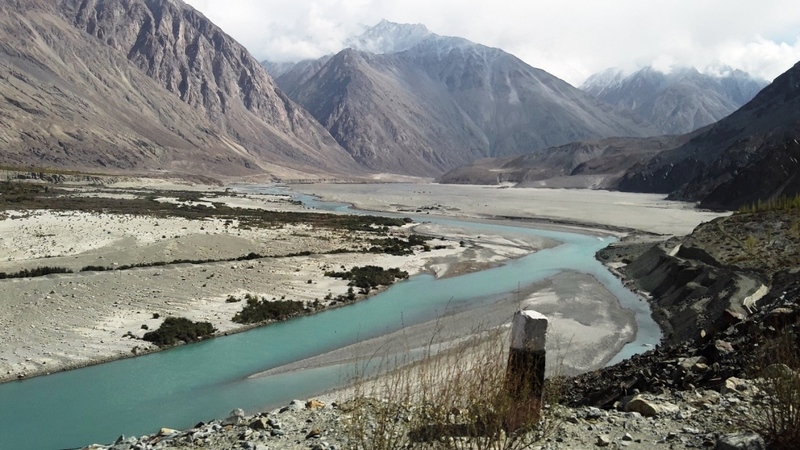 The calm and serene Shyok river was now speeding and bumping up and down over the rapids. 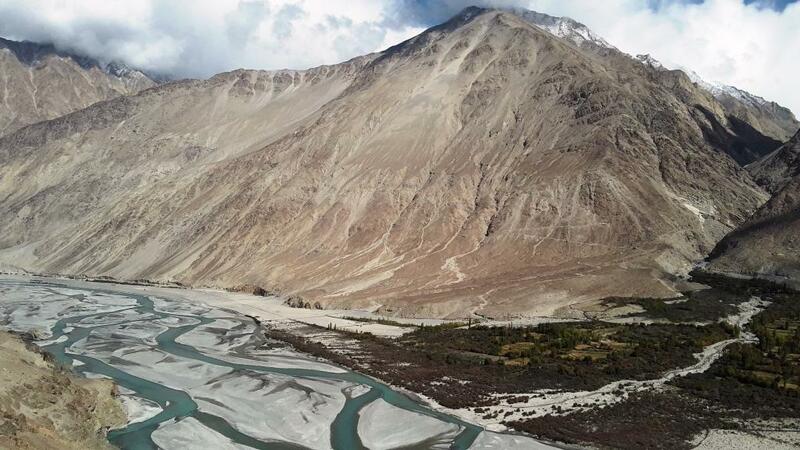 The mountains around us adored multiple folds, wrinkles and scars leaving their gentle looks. The snow caps were perhaps having a watching eye on the river basin with all of this graceful elegance. We crossed another iron bridge entering into the right side of the river bank. 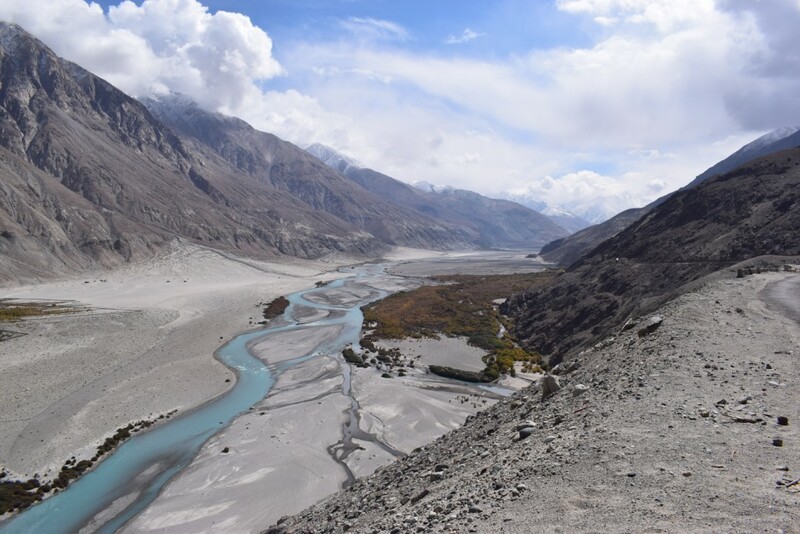 An amazing valley was awaiting us. 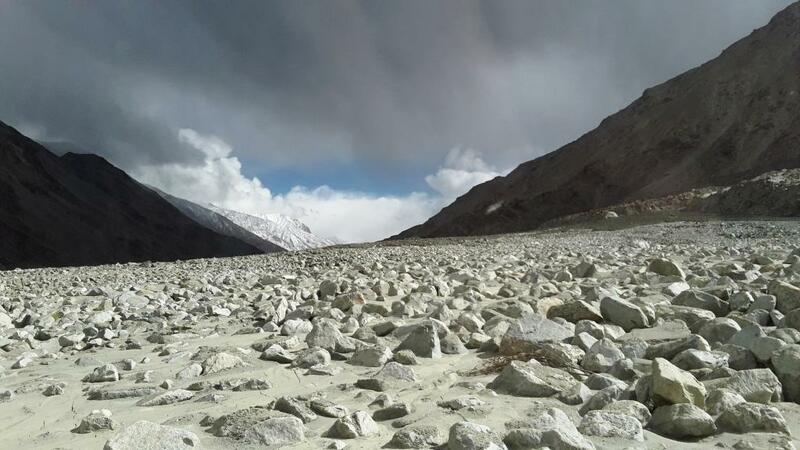 The road was suddenly lost in the snow white muddy floor covered by white mud, boulders and slippery pebbles scattered like mayhem in the mountains. 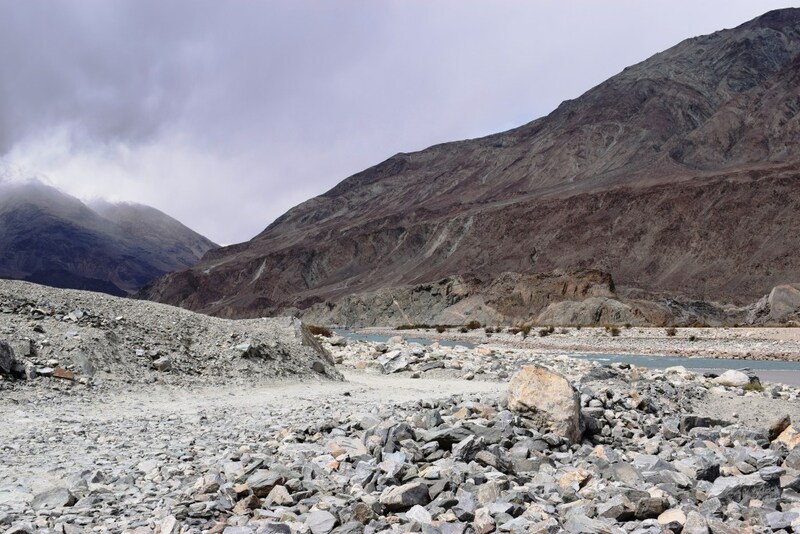 The mountain slopes too had merged with this peculiar wide muddy bank with debris piling down like a flowing stream. 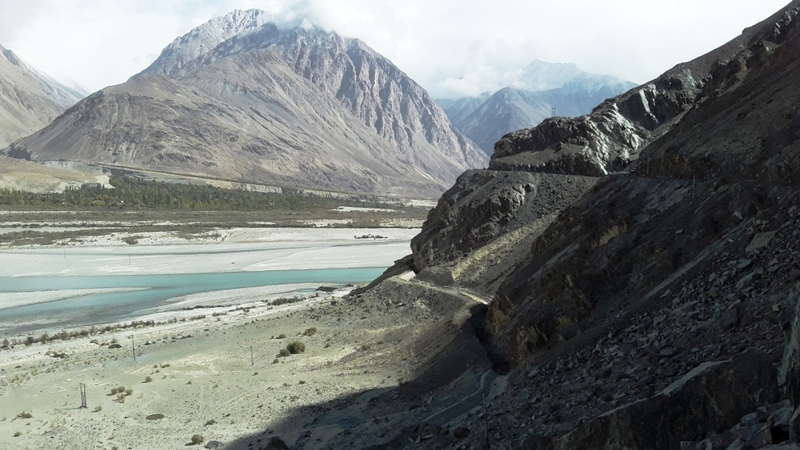 This was the much awaited peril in the Shyok-Khalsar road. It was a clear and dry day. Even with no rain around we were struggling to keep our foothold on the treacherous soft mud and the boulders piled here and there. It took us an entire 15 mins to cross this dangerous strip of this land. Hassanji stopped the vehicle for a breather after entering a much stable pebbled track. This is the first time in the entire trip we found him bothered with an invisible tension. He unbuckled his rucksack to share some lovely apples collected yesterday evening from the apple vines surrounding our guest house at Hunder. Taking a bite into his apple he said, “This is one of the most dangerous strip of a road one can ever encounter in these parts of Ladakh. 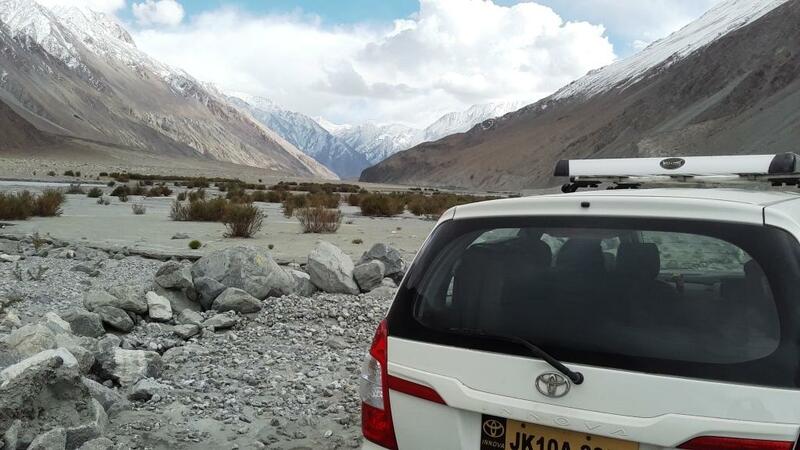 Our vehicle could have been easily stuck here for hours in the muddy debris!” Later on while we were in Pangong he indicated that the Shyok road remained closed for all vehicles during June-July-August. 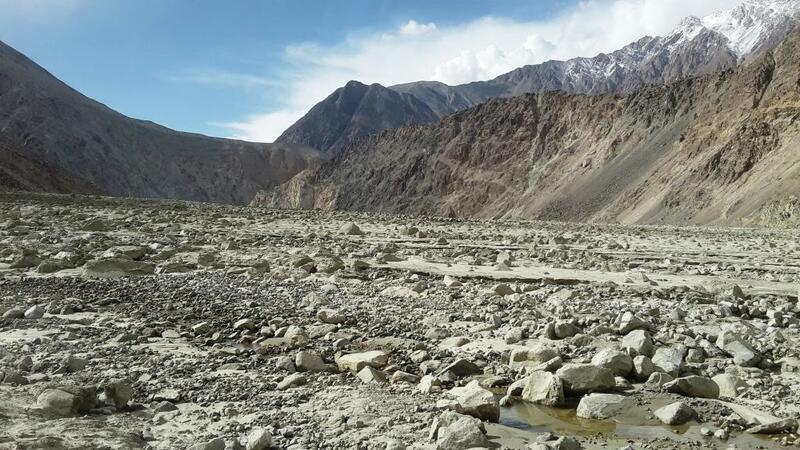 Glacier melts and their flowing muddy debris would pile up causing blockage and flood in the Shyok basin making the road totally inaccessible. 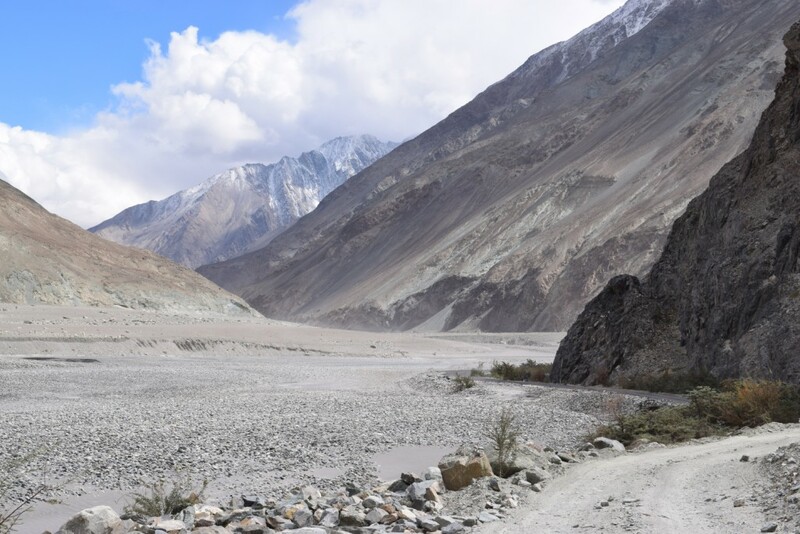 The road soon got better as we left the treacherous mud stacked valley. 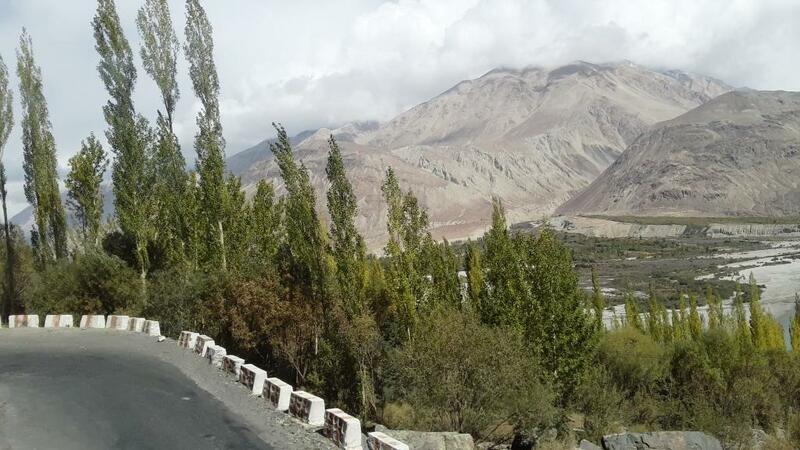 We were once again climbing uphill bifurcating from the narrow road moving down towards the Tanyar village. 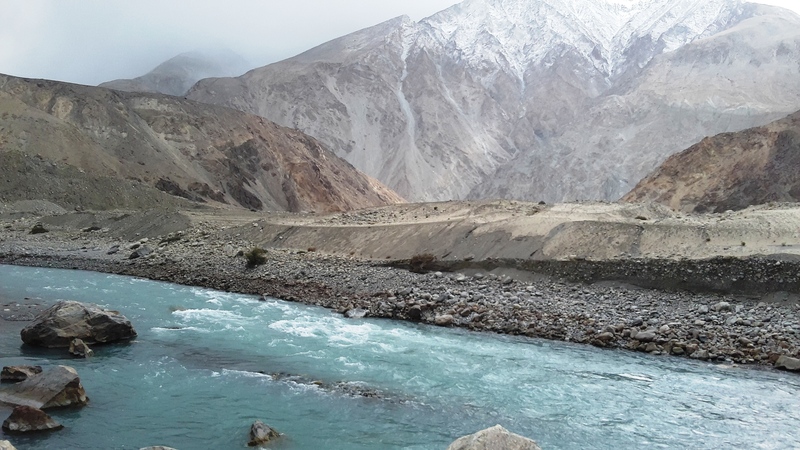 The Shyok river gorged its way into the giant snow clad mountains moving further and further away from our sight. 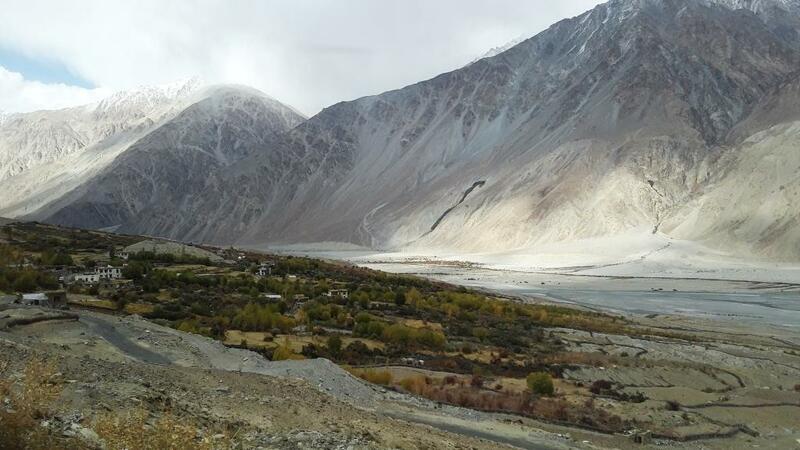 Another ten minutes climb led us into the Shyok village. The gigantic snow cap mountains lying to our right looked formidable. 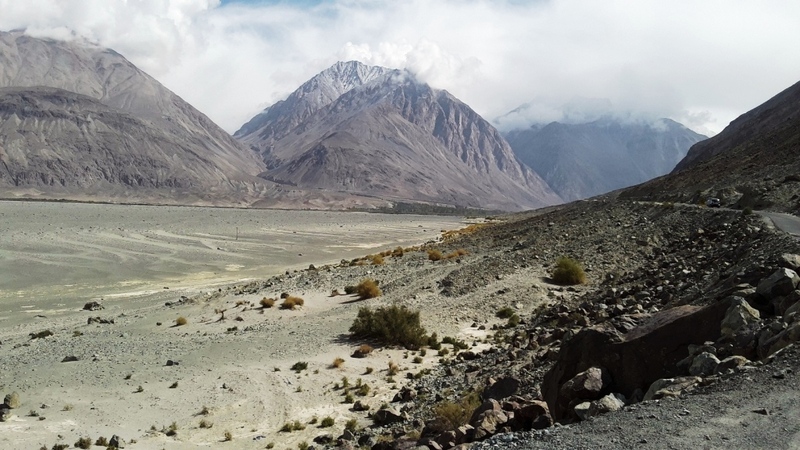 We wondered whether the stiff uphill road lying ahead would lead us towards any of these mountains. With a cup of hot black tea, Hassan Ji was busy in conversation with the local tea stall owner at Shyok. There were hardly any signs of tension and stress in his happy to go gestures. 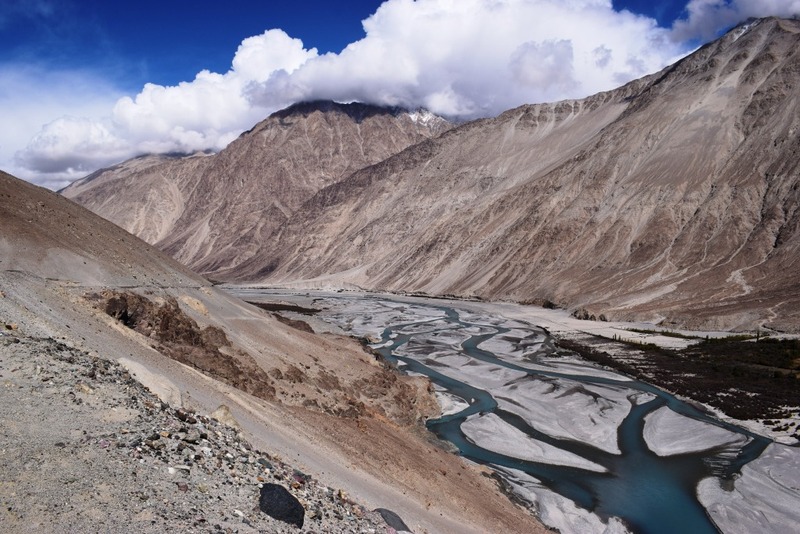 Perhaps the harsh life in the mountains of Ladakh had made him a stronger, stress resistant person. 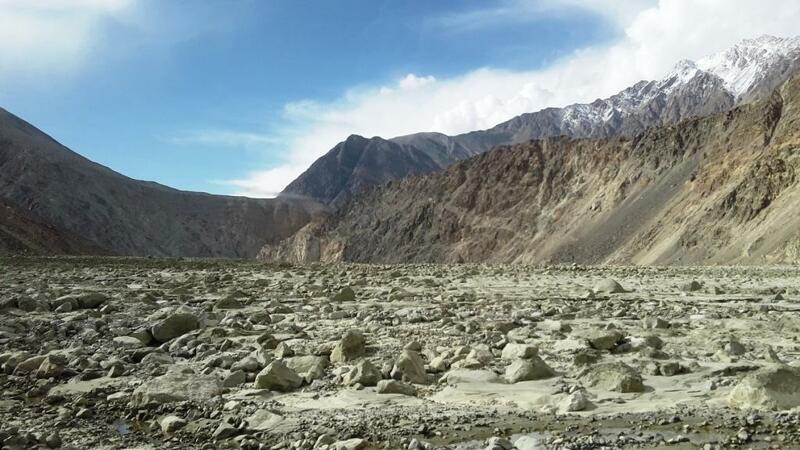 For us the adrenaline rush on the Shyok trail was already having its toll with fatigue shadowing all over us. 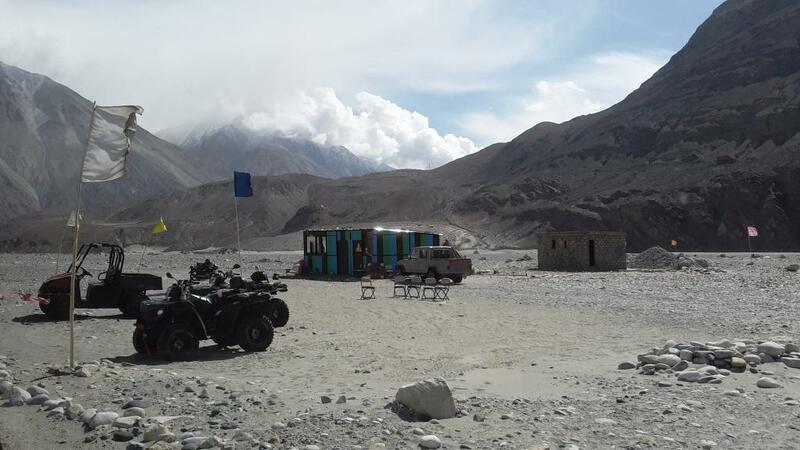 The short tea break at Shyok was much needed to rejuvenate and inspire ourselves for another three hour long ride to the Pangong Lake. লাদাখের ওপর ব্লগপোষ্টের জন্য অপেক্ষা করছি… 🙂 Kindly leave the link with me on Twitter when you publish it….